[STEPHEN H. BRANCH]. Broadside. Important! to the Public ... The Republican Candidate for the Presidency, John C. Fremont, of Foreign Birth. Ogdensburgh, N.Y. October 31, 1856. 1 p. 10½ x 7½ in. Foxing, some paper remnants on verso. 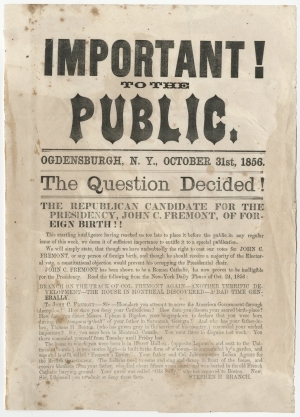 A campaign poster for the first Presidential election with a Republican candidate, John C. Frémont. This broadside makes a sweeping attack against Frémont, claiming he is ineligible for the Presidency as he was born in Montreal and also unsuitable for the position because he was a Roman Catholic. In fact, Frémont was born in Savannah, Georgia, but he was the illegitimate child of Virginia socialite Anne Beverly Whiting and her Canadian-born French tutor, Charles Frémon. In early 1854, then United States Senator Salmon P. Chase became a prominent leader of the anti-slavery forces in the United States. He capitalized on the controversial Kansas-Nebraska Act to create a new political party from the remnants of the Free-Soil, Whig, Democrat, and Know-Nothing (American) parties. The new fusion party, the Republican Party, nominated Chase as candidate for Ohio governor in 1855. He won, becoming the highest ranking Republican in the United States. He then helped create the national Republican Party in 1856, hoping to become its nominee for president. Instead, the nomination was instead given to John C. Frémont, with the associated controversy. John C. Frémont (1813-1890), “the Pathfinder,” was a legendary explorer who achieved military victories in California during the Mexican War. He entered politics as California’s first senator and then became the first Republican presidential candidate in 1856. Frémont was a controversial general during the Civil War, commanding the Western Department from St. Louis in 1861, and West Virginia in the first half of 1862, before being pushed out of service.